In reaction to the first oil crisis of the mid seventies, the kingdom of Saudi Arabia decided to decrease its dependency on food imports by developing local food production using water from deep, non-renewable aquifers. This has now been going on for about thirty years now, and the country realized that, maybe, water is a more precious resource than oil, in the long run. The result is a decision to – literally – phase out this unsustainable form of agriculture by 2016, while massively “investing” in foreign – and developing – countries, i.e. leasing or buying land (the details are rarely known) to grow food abroad for export to Saudi Arabia. The “investment” has also been termed “land grab” and it is seen by many as a form of neo-colonialism. How sustainable this will be, agronomically, economically and politically, is open to debate… and certainly worth watching closely. 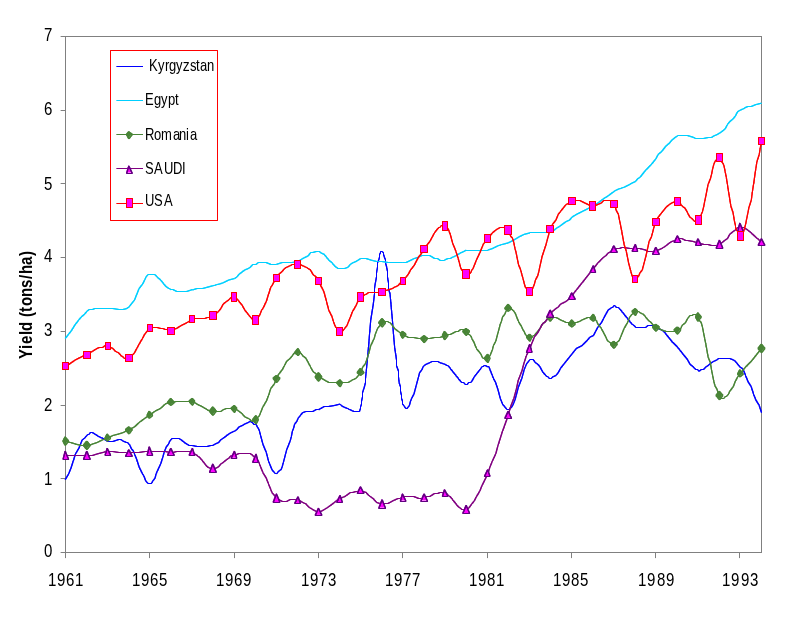 The time series of wheat yield (Note 1) of Saudi Arabia differs from that of any other country in the world. The figure shows that yields were stable at about 1.2 T/Ha until 1970, dropped to 0.6 or 0.7 T/Ha until 1980 after which they increased to 4.2 T/Ha in just a couple of years (between 1981 and 1987); thereafter, they remained stable until at least 1994. More information will be given below for the post-1994 period. I am not sure what the first drop is due to, but I guess it is just a “statistical adjustment”, i.e. someone realised that the values (guesses!) were unrealistically high and adjusted them dowm to a more realistic value of about 0.65 T/Ha. What has happened in, or maybe to Saudi Arabia? The first oil crisis of 1973 (also known as Arab oil embargo. Click here for graph of oil prices), itself a consequence of the Yom Kippur war (Wikipedia has all the details) showed that oil is definitely a weapon and that oil importers can be very vulnerable. This has been amply shown by more recent wars! Another consequence of the oil crisis was that Saudi Arabia understood, or probably was made to understand that food is a weapon too. While the west is vulnerable to irregular oil supply, the countries in the Arabian peninsula do not produce enough food for their domestic consumption, and this is a major source of vulnerability too. 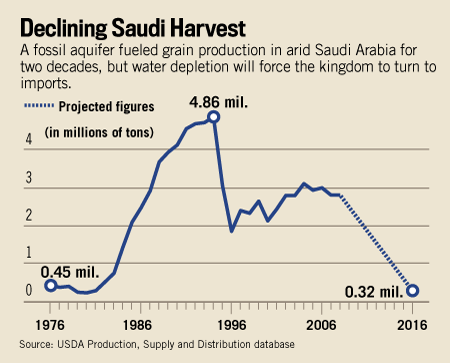 As a consequence, Saudi Arabia decided to increase its food security by producing its own food or, at least, by dramatically reducing its dependence on imports. But how do you grow food in the desert? You irrigate! Where does the water come from: from deep aquifers where it has been accumulating thousands of years ago, probably during the time when glaciations affected most of the northern hemisphere up to 10000 or 15000 years ago. The problem is that the resource is not renewable. Water supply peaked around 1993-94 and has thus been decreasing since then: growing crops consumes a lot of water, especially in the desert. There is ample documentation on Saudi water issues, for instance here and especially on the site of the Encyclopedia of earth and FAO. Some wheat statistics in Saudi Arabia since 1961, based on data in FAOSTAT (http://faostat.fao.org). Note the logarithmic scale adopted for the ordinate. The uinits are given in the legend. Wheat (i.e. bread) is the main staple of Saudi Arabia. 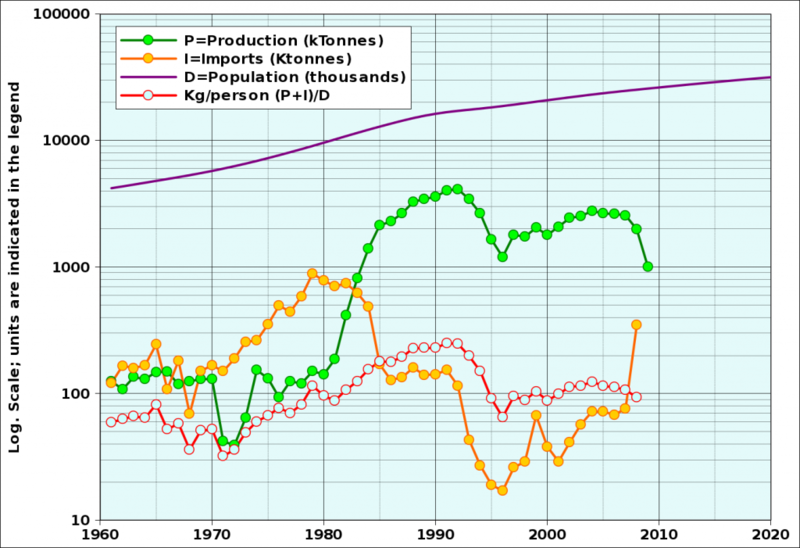 The figure shows some recent patterns of production, imports, population and per capita supply. It is immediately apparent that the decision to produce food nationally has drastically reduced the dependence on imports: they dropped from 888 thousand tonnes (Ktons) to just 17 in 1997. The production has peaked at about 4 million tons (Mton) in the early nineties, which coincided with the peak in fossil water use. From 1995, the production has varied between 2 and 3 Mtons, while imports increased from 1996 low to around 347 Ktons in 2008. In the same period, the population grew from 16 to 26 million people. It is projected to reach 32 million in 2020, which will entail an increase of food requirements of about 20%. The figure also shows that the recent ratio of wheat availability to population remained stable at about 100 Kg/person/year, which can be used to project future wheat requirements based on population patterns. The Saudi population is made up by about 22% of non-nationals. While many are active in the oil industry, the majority is employed as household servants and the less qualified jobs. Many are from Asia, especially Bangladesh and Indonesia. Source: wikipedia. If you look at the yield time series above, you will notice that Egyptian yields are rather stable, and higher than US yields, for instance. This is because all of Egypt’s food production is irrigated with water from the Nile (i.e. water supply is not very variable from year to year, contrary to rain in the US Midwest) and solar energy is in ample supply because the Nile flows through the desert: the climate is dry, i.e. it doesn’t favour diseases (unlike wet climate: see the post on the Irish famine of 1845), and it does not undergo marked variability from year to year. 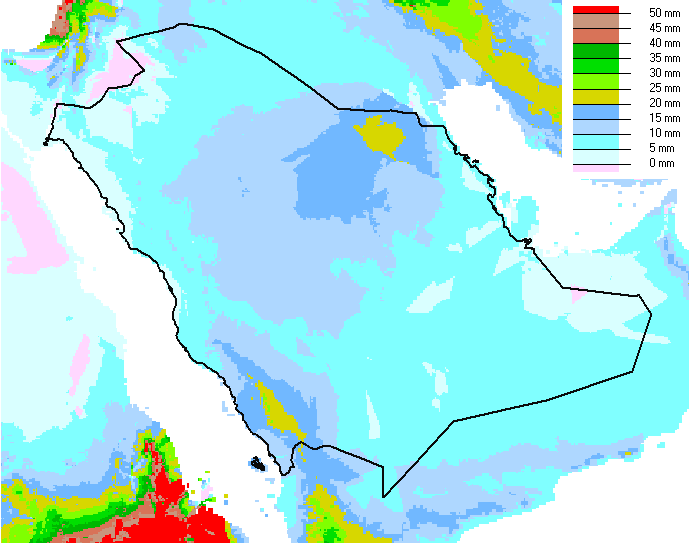 Saudi Arabia is a dry to very dry (hyper-arid) place, but it does rain, especially in the SW and in the centre, for instance in the province of Hai! Elevations in Saudi Arabia, in meters above sea level. Note the terrain generally slopes down from the west to the east. Average monthly rainfall, in mm. Tortal annual rainfall is obtained by multiplying the values by 12. 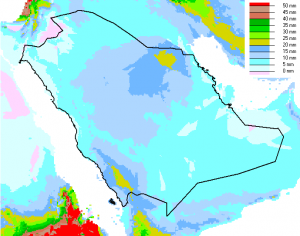 Elevation and rainfall map in Saudi Arabia. Click on the maps to enlarge them. The maps were prepared with J. Grieser’s New_locClim software downloadable from the website of FAO. Based on the climate data, it is possible to estimate the production potential for a given crop in a given place. Monthly contribution to potential wheat yield, rainfall and wheat water requirements for “high” and “low” water use efficiency. The data were obtained from New_locClim for the decimal coordinates 44.442 N and 26.603 E representative for a major wheat producing area in Hail province. The value of of 5.20 T/Ha, which corresponds to the actual crop calendar also corresponds to the yields achieved in the country (see figure in note 2), which indicates that the available solar energy is used very efficiently. What about water use and use efficiency? It has been know from the 1950s and the work of de Wit and the Wageningen school of agronomists (de Wit et al., 1978; FAO, 1978) that there is a relatively constant ratio between cereal amounts produced and the amount of water needed. The “constant” can be expressed in various ways, and the water can be supplied by rainfall or irrigation, or a combination. It is known as “water use effiiency” or WUE and corresponds approximately to 500 litres of water for every Kg of wheat produced in very efficient systems, but usually the value is closer to 1000 litres under average conditions. See note 3 for details. It is difficult to estimate exactly how much non-renewable water is used by crop agriculture in Saudi Arabia, because of large inter-annual variability of rainfall, and because the water use efficiency is not know precisely. If we adopt the “average” value of 750 litres per Kg of grain, half-way between “average” and “very efficient” water use, the production of 2008 (1986 KT, rounded to 2000) corresponds to 1.5 billion m³ of water, which is 1.5 km³. Accumulated over the period from 1981 to 2009 (inclusive), the water consumption for wheat production amounts to 49 km³. Other crops (sorghum > maize > barley) add another 400 KT of production per year. Therefore, the total water use since 1981, assuming the same water use efficiency, must have been around 65 km³. This is equivalent to about 220 days of average nile flow at a rate of 0.3 km³ per day. According to FAO, useable water reserves amount to about 340 km³, but they are replenished at a very slow rate of 2.2 km³ per year. If we further consider that only 8% of water used in the kingdom comes from desalination and that 80% of water use goes to agriculture, the abrupt end of the food self sufficiency dogma becomes obvious: if the current policy continues, deep water reserves will have been reduced to less than 190 km³ by 2050… and this takes into account only population food requirements and agricultural uses! There are many sources about the current quest for land abroad by Saudi Arabia. The two paragraphs that follow (both from farmlandgrab.org) provide some history and indicate which way the country is looking: In January 2009, King Abdullah bin Abdulaziz proclaimed a “food security initiative,” backed by an investment fund of 3 billion Saudi riyals (about $800 million), to support investment by private sector Saudi companies in agricultural projects abroad. According to the government, “The King Abdullah Initiative for Saudi Agricultural Investment Abroad aims at contribution to realizing national and international food security, building integrative partnerships with countries all over the world that have high agricultural potential to develop and manage agricultural investments in several strategic crops at sufficient quantities and stable prices in addition to ensuring their sustainability.” In plain English, that means the Saudis intend to use their capital to develop farm projects in countries that have agricultural potential but lack the money to acquire the irrigation pumps, tractors and harvesters, fertilizer, farm-to-market roads and refrigerated warehouses needed for major increases in output. Who will be the “beneficiaries”? Among the targeted countries are Sudan, Ethiopia, Vietnam, the Philippines, Mozambique and Ukraine. The situation is very dynamic. Recent news mention a major deal with Ethiopia: 2.5 billion US$. Will Saudi businessmen pay much attention to environmental issues? Unlikely! Will they pay much attention to human rights, women’s rights, equity and the food security of the “partners” ? That’s unlikely too! In spite of the text above, will they pay attention to international food security, and if they do, what will happen in times of crisis in the developing partners countries? According to the database of the International Land Coalition consulted on 20110922, Saudi Arabia has made deals with the Philippines (290 kHa) and Ethiopia (310 kHa). In Ethiopia, the largest area (300 kHa) is apparently to be used for agrofuel production under joint Saudi/Ethiopian investment. There are thus many uncertainties. What is certain is that food seems to have become the strongest currency! I suspect that those who will pay, in the end, are those who are short of the strongest currency today. 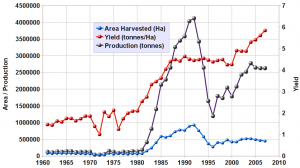 Note 1 : yield is the intensity of crop production over a given area. It measures how well a crop performs and is usually expressed in tonnes of grain produced per hectare. For wheat, the order of magnitude varies, according to countries and environmental conditions (including climate) from 1 to 10 tonnes per hectare (T/Ha). Yields have a lower limit (0 T/Ha) when nothing is harvested, for instance because of drought, to an upper limited that depends essentially of available solar energy, water and soil fertility. The maximum achievable yield in a given location is the potential yield, given sufficient supply of inputs (including water). The potential yield is climatically determined. The potential yield for a given crop cannot be exceeded. Genetic improvements can raise it a bit, but wheat remains wheat. There is usually a direct link between accumulated crop mass (roots, straw, grain, i.e. biomass/Ha) and water use, expressed as “actual evapotranspiration”. See Gommes, 2010 for details. Since yield is production divided by area, the total production of a country is obtained from the cultivated area multiplied by the average yield over that area. where H is the global net radiation and EffH, Effa and Effc are conversion efficiencies. Refer also to GCEP, 2005 and Zhu et al., 2008. For the generic subject of Radiation use efficiency (RUE) the following were also consulted, starting with the classic Sinclair and Muchow (1999), then Miranzadeh et al., 2011, Li et al., 2011 and Zhu et al, 2010. Note 3: The order of magnitude of wheat WUE is about 1100 litres of water for every kg of wheat grain produced in semi-arid conditions (Morgan, 2003; Taley et al., 2003; Bastiaanssen, 2004; Zwart et al., 2004; Angus, 2006; Alghariani, 2007; Lamaddalena et al., 2007; Abd El-Rahman, 2009; Zwart et al., 2010). The best WUEs obviously correspond to lower amounts of water: they are close to 450 litres for 1 Kg of grain (Sadras & Angus, 2006; Botwright-Acuña, 2010). We can round the two values to 1000 litres to produce 1 Kg of wheat for farming systems of average efficiency and to 500 litres for highly efficient systems. These concepts are described with some detail in the downloadable files listed in the references under Gommes (1999), Steduto (2006) Gommes et al. (2009), Gommes (2010), Zhu et al (2010) and the crop physiology lectures by E. Earl (not dated, but available on the internet). Abd El-Rahman, G. 2009. Water Use Efficiency of Wheat under Drip Irrigation Systems at Al-Maghara Area, North Sinai, Egypt. American-Eurasian J. Agric. & Environ. Sci., 5 (5): 664-670. http://idosi.org/aejaes/jaes5%285%29/12.pdf. Alghariani, S.A. 2007. 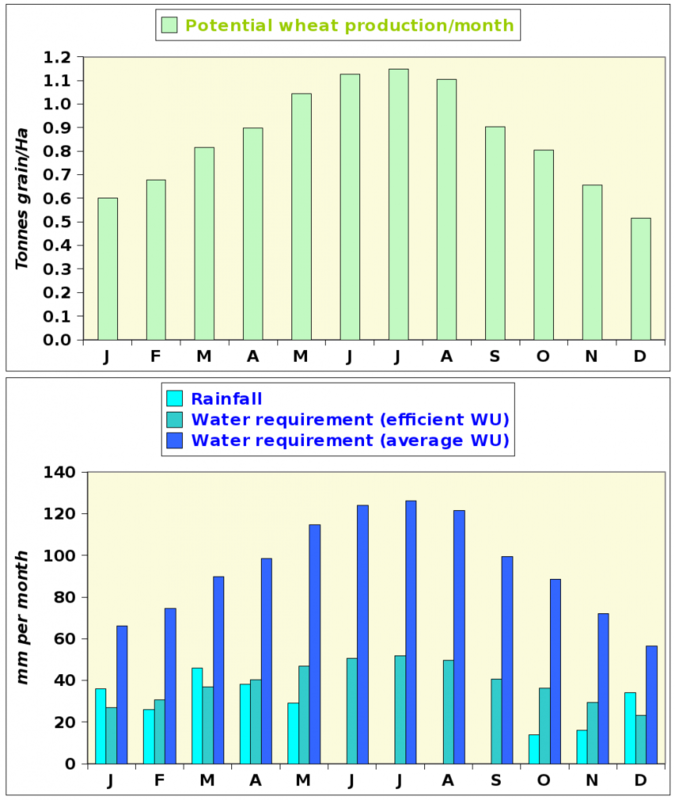 Reducing agricultural water demand in Libya through the improvement of water use efficiency and crop water productivity. Pp. 99-107 in: Lamaddalena et al., 2007. Amanullah, J. & N.Maimoona. 2007. Response of wheat to farm yard manure and nitrogen under rainfed conditions. African crop science proceedings, 8:37-40.
de Wit, C.T., J. Goudriaan, H.H. van Laar, F.W.T. Penning de Vries, R. Rabbinge, H. van Keulen, W. Louwerse, L. Sibma & C. de Jonge. 1978. Simulation of assimilation, respiration and transpiration of crops. Pudoc, Wageningen, 141 pp. Ehsanullah, A.A.C., A. Ghaffar, M.A. Randhawa. 1999. Dry matter partitioning into root and shoot of wheat genotypes sown at different depths and dates under rainfed conditions. Int. J. Agric. Biol. 1(4):250-253. FAO, 1978. Report on the agroecological zones project. Vol.1: Results for Africa. World Soil Resources Report 48/1. FAO, Rome, 15pp. and 8 tables. Gommes, R. 1999. Roving Seminar on crop-yield weather modelling; lecture notes and exercises. WMO. Geneva, 153 pp. ftp://ext-ftp.fao.org/SD/Reserved/Agromet/Documents/agro003a.pdf. Kumar, L. & J.L Monteith. 1981. Remote sensing of crop growth, In: M. Smith, Ed., Plants and daylight spectrum. Academic press, London. pp. 133 144. Lamaddalena, N., C. Bogliotti, M. Todorovic, A. Scardigno (Eds), 2007. Water saving in Mediterranean Agriculture & Future Research Needs, Proceedings of the International Conference, 14-17 February 2007 – Valenzano, Italy; Options Méditerranéennes Série B n. 56, 289 pp. Lauciani, E, & A. Ponticiello, 1993. Photosynthetically active radiation, empirical determination and literature survey. FAO Agrometeorological working paper series N. 7. FAO, Rome. 85 pp. Li, H.L., Y. Luo & J.H.Ma. 2011. Radiation-use efficiency and the harvest index of winter wheat at different nitrogen levels and their relationships to canopy spectral reflectance. Crop & Pasture Science, 62:208–217. Mahmood, Naeem & R.N. Ahmad. 2005. Determination of Water Requirements and Response of Wheat to Irrigation at Different Soil Moisture Depletion Levels. Int. J. Agric. Biol., 7(5):812-815. http://www.fspublishers.org/ijab/past-issues/IJABVOL_7_NO_5/28.pdf. Miranzadeh, H., Y.Emam, H.Seyyed & S.Zare. 2011. Productivity and Radiation Use Efficiency of Four Dryland Wheat Cultivars under Different Levels of Nitrogen and Chlormequat Chloride. J. Agr. Sci. Tech., 13:339-351. Rehman, S. 1998. 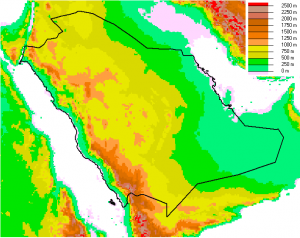 Solar radiation over Saudi Arabia and comparisons with empirical models. Energy, 23(12):1077–1082. Sadras, V.O., F.F.Angus. 2006. Benchmarking water-use efficiency of rainfed wheat in dry environments. Australian J. Agric. Res., 57(8)847-856. Siddique, K.H.M., R.K.Belford & D. Tennant. 1990. Root:shoot ratios of old and modern, tall and semi-dwarf wheats in a mediterranean environment. Plant and Soil, 121:89-98. Sinclair, T.R. and R.C. Muchow. 1999. Radiation use efficiency. Adv. Agronomy, 65:215-265. Yin, X. & A.H.C.M. Schapendonk. 2004. Simulating the partitioning of biomass and nitrogen between roots and shoot in crop and grass plants. NJAS 51(4):407-426. Zhu,Xin-Guang, S.P.Long & D.R.Ort, 2010. Improving Photosynthetic Efficiency for Greater Yield. Annu. Rev. Plant Biol. 2010. 61:235–61. http://www.tbi.univie.ac.at/~raim/harvest/workshop.brno/references/zhu10.pdf. irrigated wheat, rice, cotton and maize. Agric. Water Management 69: 115–133. Zwart, S.J., W.G.M. Bastiaanssen, C. de Fraiture & D.J. Molden. 2010. A global benchmark map of water productivity for rainfed and irrigated wheat. Agric. Water Man., 97:1617-1627.
wait to take a look when I get home. I’m amazed at how fast your blog loaded on my phone .. I’m not even using WIFI, just 3G .. I have always wondered to what level it is possible to take a text without mentioning any subject, as in the spam comment above. Clearly, the trick is in “the information (you present)”, which can be anything. It would also be possible to mention the “complexity” of the subject, it’s various facets, stakeholders etc. while still maintaining an apparent logic. There is also historical considerations, the institutional context and “other authors.” Let’s try: The subject is obviously complex. It should be possible to better understand related issues if we paid greater attention to the roots of the current situation and the institutional context, but then we are likely to run into difficulties with the data. They are, as we all know, rather uncertain. This is probably why there is no consensus on the likely future developments among different authors. Only additional research will tell us! The expression “International food security” is amazing for a country like Saudi Arabia. It looks like to the expression “energy security” for the USA…. except that USA is a superpower country with a super power army. One the other hand, what Saudi Arabia wants to do, is like the delocalization of the US and european industry in China. China learned how to process and produce high tech goods at a very competitive price (due, of course to very restrictive rights) ! Is there any sustainable solution for this very rich country (who cares?). I think the only solution is a peacefull middel east region where food goods can be exchanged between high rainfall (Ex. Lebanon, Turkey) and dry countries (Ex. Saudi Arabia, Irak, Jordan). Très intéressant et clair. Cela soulève de multiples problèmes, je n’en évoque que quelques uns… Les terres au loin impliquent une puissance militaire qui peut être projetée (une des raisons pour l’augmentation de la capacité militaire de la Chine et aussi de sa maîtrise grandissante du commerce maritime) pour “défendre” les contrats. Sinon le pays est vulnérable et à la merci d’un gouvernement qui revient sur ses engagements. Le locataire a intérêt à ne pas bien gérer les terres , mais à les exploiter… Le pays qui loue perd sur tous les plans: terres et leur qualité, sécurité alimentaire, déplacement de populations, corruption et l’argent de la location placé dans des comptes à l’étranger.. D’où un grand risque d’instabilité sociale qui peut facilement se focaliser sur l’étranger… et les locataires avec quelques massacres en perspective. En fin de compte on risque d’aboutir à deux pays sans ressources au lieu d’un seul et the buck (wheat) has to stop somewhere! Je suppose que la situation de pays comme l’Arabie Saoudite et celle la Chine sont très différentes! La Chine a des ressources renouvelables, et l’Arabie Saoudite n’en a que peu. Selon la source habituelle (http://en.wikipedia.org/wiki/Oil_reserves_in_Saudi_Arabia) les réserves en pétrole ne sont pas bien connues, mais seraient voisines de 43 km³. C’est le même ordre de grandeur que l’eau consommée par l’agriculture depuis 1981! Amusant, si on veut… Les réserves en eau de l’Arabie Saoudite sont 8 fois supérieures à ses réserves en pétrole. elle-même du Moyen Orient. Un pays hésitera à remettre en cause un accord avec l’Inde ou la Chine, mais l’AS ne fait tout simplement pas le poids sur le plan démographico-militaire. Rene, very interesting how you combine the technical facts with political ones…the “land grab” has a lot of similarities to the multinationals, and it is clear that this does not mean that there will be an improvement for the society and/or the host country. A good example of the consequences is of Unit Fruit Company in the Central American countries (nowdays replaced by Chiquita Brands International and Del Monte Foods). China and South Africa are doing also contracts for renting the land in Ethiopia, Mozambique and in others african countries. Who should revised this contracts? the local government or should be an international entity that should clearance the conditions to favor a balance of the terms? Thanks for the comment, Oscar; the parallel with Chiquita and Del Monte is very appropriate! Do the multinationals actually own the land? Oscar, after answering to Jacques (below) who mentions important vulnerability issues, can you tell me if there have been serious conflicts with Chiquita or Del Monte (of course, the US government is behind them!) Do you know any good sources on the subject? “Three quarters of pineapples sold in Europe are grown in Costa Rica, where pineapple production is highly industrialised. Growers typically use 20 kg of pesticides per hectare in each growing cycle, a process that may affect soil quality and biodiversity. The pesticides – organophosphates, organochlorines and hormone disruptors – have potential to affect workers’ health and can contaminate local drinking water supplies. Many of these chemicals have potential to be carcinogens and may be related to birth defects.